While restaurant and bar openings in Birmingham are a frequent occurrence nowadays, a new venue that has the associations of Nosh & Quaff is rather more rare, for it comes from the same stable as the much applauded Lasan, Fiesta Del Asado, and Raja Monkey, this being the fourth eatery from Chef Aktar Islam and his business partner Jabbar Khan. Those not recognising those names may recall the Lasan team won Gordon Ramsay’s F-Word Best Local Restaurant in 2010. The massive conversion they’ve undertaken on the beautiful Grade II listed Edwardian Baroque style building in the city’s historic civic district is impressive. 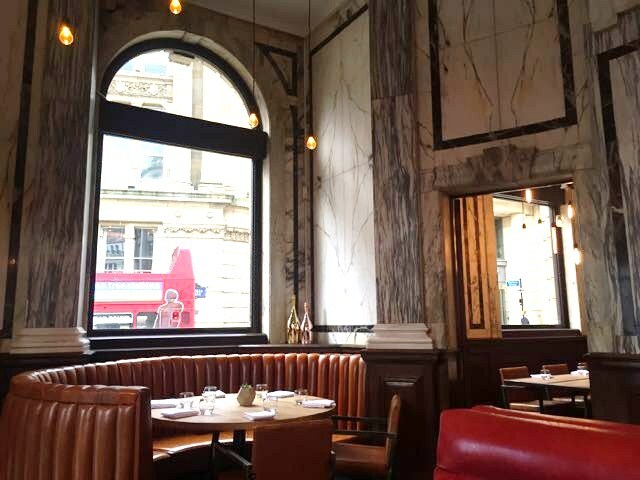 Original features are repaired and complimented by an industrial look of metal and exposed brick, softened by leather seating and the original ceramics and intricate plasterwork. The ground floor and basement are particularly impressive, and I’m very pleased that they’ve kept so much of the original. 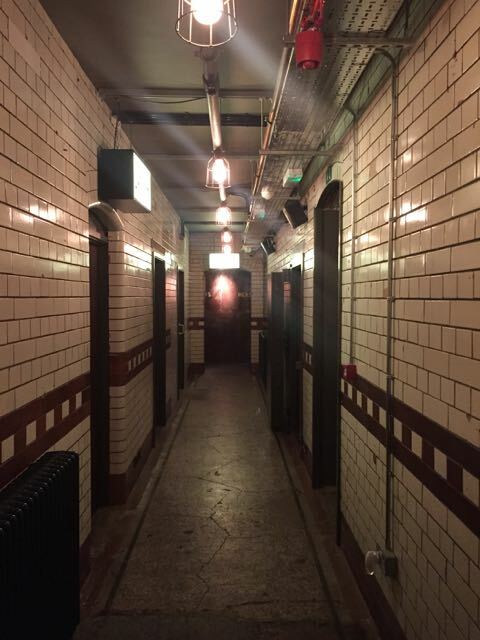 The basement corridor for the toilets is a great place to see some more of the original detail with floor to ceiling tiling and the original bank vault. The branding does seem to be at odds with the building. When we came across it for the first time we were somewhat surprised: Nosh & Quaff. For those unaware of the rather sexual connotations of the word “nosh” then you can check the Urban Dictionary definition here. Frankly if a branding agency has come up with that naively, then they’re not doing their job properly. If on the other hand they’ve done it to be provocative, it’s sleazy and a step too far. As is having waitresses wandering around Victoria Square advertising the brand by wearing t-shirts with something like “I like Noshing” on them while holding “Floozy, Nail the Blond” branded balloons (“Floozy” is the house lager). I’m not sure their dads would approve. I don’t like the “#letsgetmessy” hashtag either, quite apart from it missing an apostrophe, it’s just a little lowbrow isn’t it. The question is, would the food be as tasteless as the advertising? When we arrived we sat on the first floor with a beer (two-thirds of a pint are sold here as is de rigeur at the moment) and cocktails. The Floozy lager is unremarkable but we did enjoy the cocktails including one with blood orange juice. We moved down to the ground floor to eat. Some of the tables aren’t very spacious but the waitress moved us without complaint when we said we’d rather have a round table for the four of us. We ordered a reasonably priced bottle of wine while we looked over the menu. The menu here revolves around lobster and currently fashionable barbecued meat. Their #letsgetmessy motif is plastered on plastic bibs provided to all diners. I’m not sure who does want to get messy while eating, but it isn’t me, and I also don’t know who wants to wear a plastic bib. We asked for cutlery, which isn’t provided by default, and it was delivered to us without complaint. Finger bowls would be a good addition because even with cutlery wine glasses were soon sticky with barbecue sauce. We did get wet towels when we asked for them – the service was good on the whole, with bar staff and waiting staff affable and efficient. 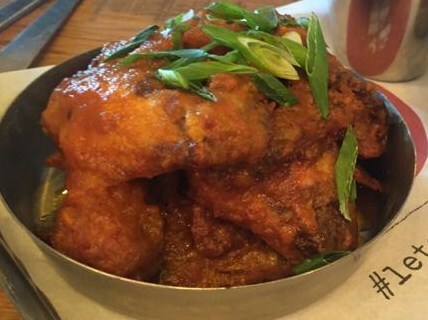 We ordered the chicken wings (£12), they were served under a strong vinegary sauce that was unpleasant. 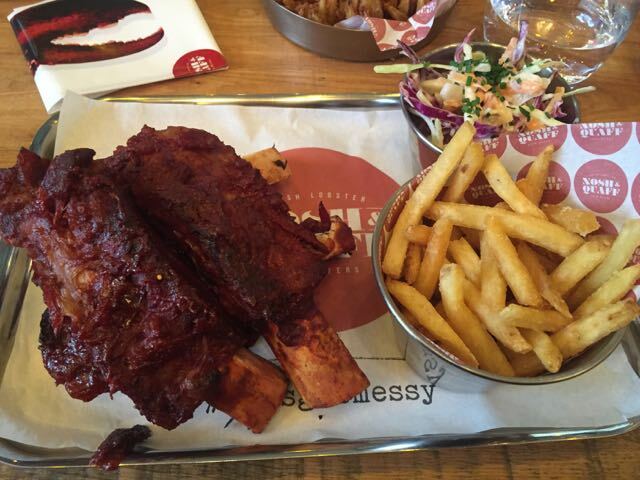 We also ordered the beef ribs (£18) which are visually appealing, looking like something Fred Flinstone and Barney Rubble would have eaten. Size wise the portions of ribs seemed different, but I suspect they were weighed the same. Unfortunately they were chewy and tasted of uncooked tomato paste and chilli. We ordered a couple of portions of macaroni and cheese (£3.95), one was like wet pasta in a tasteless white emulsion, the other was fairly successful. 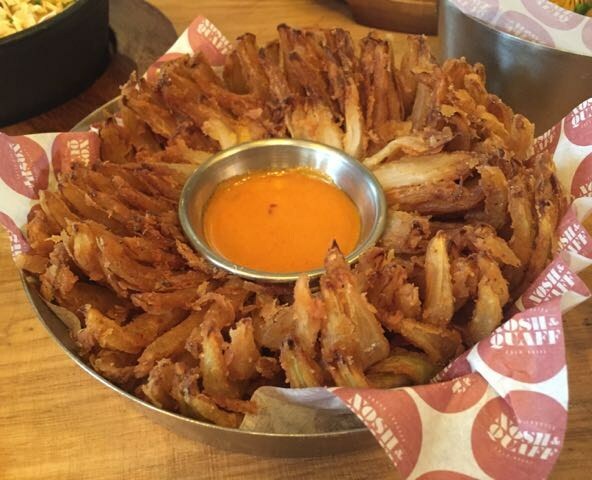 Finally we ordered a blooming onion (£4), which was greasy. The sides of fries were good. We have been told by a veggie friend that their truffled macaroni and cheese “burger” (£12) is very tasty, if a little heavy, and that their house salad and charred corn is also very good. We’ve heard from another chef friend that the lobster (£20) is very good. So in summary on the food, on our visit on a Sunday afternoon a few weeks after opening, we were very disappointed, but we’ve heard mixed reviews across the board. Perhaps it’s just inconsistent? Though to be honest at this price-point (averaging more than £16 a main) consistency should be a given. Regardless of anything it will almost certainly be a success – because of the connection with the Lasan Group, and the novelty of the bibs and low-brow branding, and in time when the kitchen becomes a bit more consistent then hopefully for the food too. We’ve already been back for drinks in the airy upstairs bar, and will invariably be back over the next few months to see whether the food is up to scratch. This entry was posted in Area: Central Shopping, Area: Colmore Business District, birmingham restaurant review, Cuisine: Modern Mixed, Price: Average, Price: Get your dad to pay - above average, Venue type: Bar, Venue type: Cocktail Bar, Venue type: Restaurant, Venue type: Wine Bar and tagged Birmingham Restaurant, birmingham restaurant review, birmingham review, eating out in birmingham, Out In Birmingham, out in brum, OutInBrum, restaurant review, where to eat in birmingham, Where To Go In Birmingham, where to go out in birmingham. Bookmark the permalink.